Abbey Mill, Annay Road, Melrose. Plans to relocate Hawick’s Burnfoot Post Office to a supermarket a short distance away will now not go ahead, it has been confirmed. The proposal drawn up to shift the facility from 5 Kenilworth Avenue to McColl’s convenience store, formerly a Co-operative food outlet, a short distance away in the same street has been withdrawn, a spokesperson for the store has confirmed. It had been proposed the move would lead to the post office increasing its opening hours to seven days a week, from 6am to 10pm daily, almost twice the 59 hours a week currently offered. It was part of major modernisation programme across the Post Office network designed to “make it easier for customers to do business, through longer opening hours and modern open-plan environments”. Now, however, Burnfoot Post Office is to be remain at its current location after all. 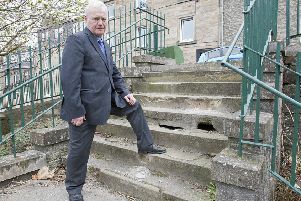 That decision has been welcomed by Hawick and Denholm councillor Stuart Marshall. He said: “McColl’s will be disappointed, but the feedback I have been getting is that people are happy the post office is to be retained.